Do all guys wear the same black tux to prom? 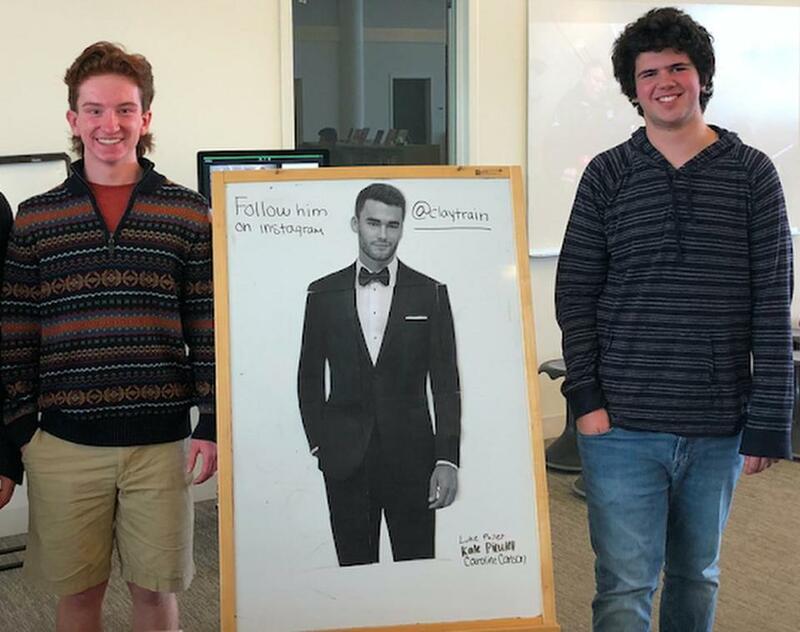 Will Meehan (left) and Spencer Torres stood next to a poster of tux model Clayton Straker. It started as kind of a bro-joke, an amusing plot hatched over lunch hour by a group of Concord-Carlisle High School junior and senior boys as a way of gently poking fun at their female classmates. But within hours, the joke morphed into a four-figure donation to a worthy regional charity — and perhaps one of the best uses of social media to which a group of teenage boys have ever applied themselves. As senior Jake Hamilton explains it, “for as long as anyone can remember” — though more likely eight or nine years — the girls at CCHS, like their counterparts at high schools all over the country, have set up a Facebook group as prom season approaches. As each girl buys a dress, she posts a photo of the dress in hopes of avoiding duplicates come prom night. Each of them shared the joke with a few friends, and by the end of the school day, 200 boys had joined the Facebook group and posted the photo. Inevitably, memes followed. Their friend Aryaman Joshi has a quick hand with Google. A little bit of online sleuthing led him to the name of the model: Clayton Straker — and his Instagram account. “Kids started messaging him through Instagram and asking if he would come to our prom,” said Joshi. The boys held a confab to discuss charities. It happened to be the eve of International Women’s Day, and all over their school were posters, presentation announcements, and reminders to wear purple in honor of women’s equality and gender parity. The friends agreed to raise money for the women’s shelter in Boston. Senior Luke Pailet set up a GoFundMe crowdsourcing site. Will Meehan describes feeling cautiously optimistic as they launched the site, with $1,000 as their stated goal. “It didn’t sound like an impossible amount to raise, and prom is still two months away,” Meehan recalled thinking at the time. But no amount of optimism on the part of the boys foretold what would happen throughout that afternoon. “At first it was slow,” said Pailet. “Then the donations started pouring in.” And so did the comments, many of them from the boys’ female peers saying how impressed they were by the choice of a charity. Seven hours after opening the GoFundMe site, the boys hit their $1,000 goal — and the number had doubled by the end of the day. But the boys quickly realized there was another step required. As an official school-sponsored event, anything associated with prom has to be sanctioned by Principal Michael Mastrullo. Knowing they would need his approval “but also thinking he could help us get the word out to the wider Concord-Carlisle community,” said Pailet, he and Meehan contacted Mastrullo to discuss it, and therein came the proverbial monkey wrench. As their principal explained to them, privacy and safety concerns mandate that no adult other than school faculty or staff is allowed to attend prom — not even a supermodel with unparalleled fund-raising leverage. Instead, Mastrullo suggested, how about a party on campus on a spring day before prom, at which the model could be feted as the school’s honored guest, donors could have their picture taken with him, and everyone could enjoy a fun afternoon of food, live music and fellowship whether they planned to attend prom or not? As of Tuesday, the donation amount stood at $3,160 from 170 donors. And one of Boston’s many worthy charities will have a little more cash in its operating budget this year thanks to the young people of CCHS, a goofy joke, a Facebook meme, and a benevolent tux model. For more about the fundraising campaign, go to www.gofundme.com/rosie039s-place-for-claytrain-to-prom. 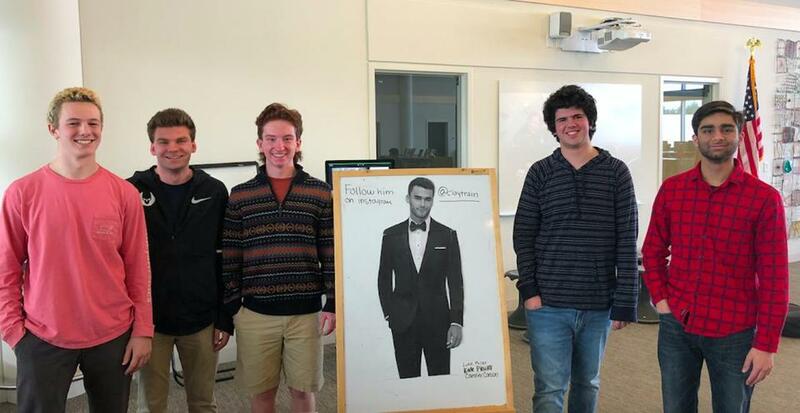 The organizers gathered in the Concord-Carlisle High School library around a poster of tux model Clayton Straker. From left, Luke Pailet, Jake Hamilton, Will Meehan, Spencer Torres, and Aryaman Joshi.